In the personal finance realm, a lot of digital ink is spilled on ways to save money and build wealth. But one topic that doesn’t get addressed very often is giving. I can understand why – personal finance is by its very definition “personal”. And avoiding talking about how we spend money, much less why should we tithe, is a great American pastime. But I think avoiding the topic of giving does a huge disservice to the personal finance community. I would argue that how you think about giving is at least as important as how you prepare for your own financial future. If you disagree, take the classic example of Ebenezer Scrooge from Charles Dickens’ A Christmas Carol. Scrooge was a financial independence success story. He had prepared well for the future, and I bet he handily met the 4% withdrawal rate rule and achieved everything the FIRE movement promised. Yet he was miserable. He probably never actively rejected the idea of giving back, he just never really thought about it. He was singularly focused on building his business, making money, and securing his own retirement. And in the process, he slowly lost his connection to his family, his community, and the world around him. If you want to really cause controversy, use the word “tithe” when referring to charitable giving. The term can have a lot of baggage depending on your background. All my cards on the table, I am coming at this from a Christian perspective, as a follower of Jesus Christ. But you don’t have to share my religious views to talk about giving. I would contend it is a universal issue, regardless of belief. In Christian circles, a tithe is usually taken to mean 10%. The tithe was established in the Old Testament times to support the religious, economic, and political systems of Israel. From a Christian perspective, I don’t believe we are required to tithe (in the strict 10% definition) anymore as we are no longer under the Old Testament laws. However, Jesus spoke more about money than almost anything else, usually as a way to expose where someone’s priorities really were. As noted by The Physician Philosopher, you don’t have to be religious to agree with Jesus’s statement “where your treasure is, there your heart will be also”. Money has a way of revealing your true motivations. While the history of tithing may be religious, I think the concept applies universally. If you are not religious, don’t let this little historical detour distract you from the rest of the message. A tithe is really just a portion of your income set aside to give to those in need and causes outside of yourself. So anywhere you see the word “tithe” you can replace it with “giving to charity” or “giving to others”. Let me start with a reason you should NOT tithe. I hear over and over that you should give because God / The Universe / Karma will reward you with an even larger monetary return. While I think there is enough anecdotal evidence to support this as happening sometimes to some people, this should not be the reason you tithe. If you give with the motivation of getting something for yourself, you have missed the point of giving entirely. I think secretly, deep down, all of us want to contribute money to causes we care about. But there are a million roadblocks our mind throws out that prevent us from actually doing it. It won’t actually make a difference. What if I need the money later but I gave it away? I’ve read too many stories of non-profits wasting money. If you’ve never given away a dollar in your life, I would encourage you to start small. Buy coffee for the stranger in line behind you at Starbucks. Help a homeless person buy $10 worth of food at the grocery store. Giving away money where I see the impact, and believe in the cause (even if it’s just making someone’s day a little brighter) is the best money I have ever spent. 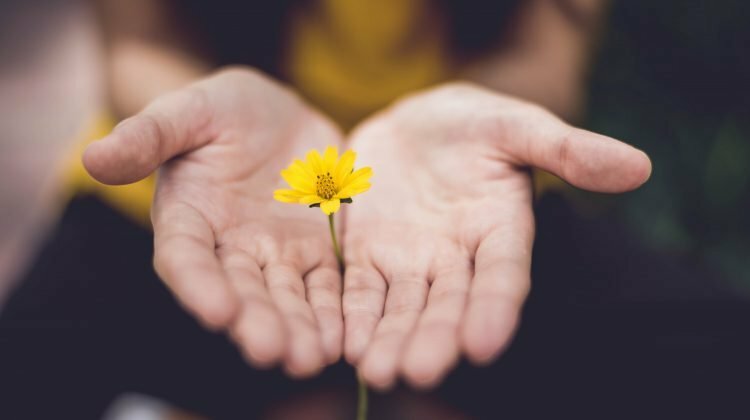 If you need cold, hard, scientific evidence to convince you, numerous studies show that generosity really does increase happiness. How we spend our money shows us what we truly care about. If you didn’t know anything about me, and studied my finances, what would be your conclusion about what was most important to me? I’m afraid you’d surmise that the person I’m most generous with is myself (or based on how much money was being socked away in retirement accounts – my future self). And while there’s nothing wrong with spending on personal wants and needs, and saving for the future, if that sums up the entirety of your spending, you might be controlled by your money instead of the other way around. For me personally, I know I have to be careful as I get closer to financial independence. It’s easy (for me) to give when I have a steady income, but there is a fear in me that once I am living off of my assets alone, I need to conserve my money, and giving is the easiest thing to cut first. As a Christian, tithing helps me to recognize that everything I have comes from God, so nothing is really mine to control and hoard anyway. Even if you are not religious, giving money away so that it doesn’t control you can have a profound effect. At the risk of stating the obvious, you, dear reader, are one of the wealthiest people on the planet. If you have an internet connection and the free time to read blogs about personal finance, you have more than 90% of the world’s population. This is really just flipping the script on the last reason. Instead of focusing on what we personally LOSE by giving, we should focus on what others can GAIN. And you don’t have to look 5,000 miles away to find a cause to support. Despite the rhetoric and “pull yourself up by your bootstraps” mentality that is pervasive in the U.S., people in our own country are in need. Just as one example, millions go hungry every day, or subsist on a sub-standard diet of highly processed food because it’s all they can access (google “food desert”). If you step back and think about how blessed you truly are, it frees you up to see how you can help others in need. This maybe isn’t a standalone point, but I wanted to highlight it because I think it can be a stumbling block to giving. Once you open your eyes and see the many needs of others less fortunate, it can be overwhelming. It’s difficult to imagine your $100 donation (or even $10,000) donation could really make a dent in world hunger, or the eradication of disease plaguing an entire continent. One of the most consistent comments I hear come out of the personal finance community is this: “I will give to charity once I have built enough wealth to support myself or my family”. Just like the position of giving for the purpose of getting back more in return, I think this attitude misses the point of giving entirely. If you give what’s left over after you have taken care of yourself, you are missing out on so many of the benefits of giving. And let’s be honest – the desire to have “enough” is a moving target. It has been well documented that people tend to spend as much, if not a little more, than they make. So if you make $50,000 you might think you’d have it made if only your income was $100,000. Well guess what? If you’re not careful, once you hit $100,000 your lifestyle has inflated to consume all of your income and now you feel like if only you made $200,000 you’d be set. And on and on it goes. If you wait until you have enough, you will never allow the power of giving to transform your life. You will become like Ebenezer Scrooge, thinking the next big income or net worth goal will finally bring you the happiness you desire. Giving money to charity is just as much an investment as putting it into my 401k. Both earn interest, and if invested wisely produce a return far greater than my initial contribution. In the case of giving, instead of earning interest, it pays dividends in a less quantifiable way: the impact on the lives of those that are direct recipients of my donation, and every life touched by that direct recipient. In this way, my original donation compounds, creating larger and larger returns over time. By waiting to give until I have enough (whenever that is), I am missing the years of compound growth of my giving. As an example, if I give money now to build a well for a small village, I’ve affected the lives of each of those villagers for the better. Perhaps now instead of worrying about walking 10 miles a day to access clean water, they can focus their time and energy on growing a herd of cattle to provide milk and better nutrition for the village. And perhaps that better nutrition saves the life of a young child who would have otherwise died, and he or she went on to make their own mark on humanity through their generosity in time and/or money. That one small contribution explodes into hundreds, if not thousands of big and small positive improvements – and the impact only grows with time. Giving now, even if small, can have a huge impact on the world – perhaps many times greater than if you waited 20 years and had 20X as much money to give. There is a place for putting money away now to donate later, but for all the reasons stated above, I would encourage everyone to give at least some money now. When I started thinking about giving in this way, it changed my perspective, and gave me all the more reason to make sure I wasn’t hoarding all my money for an unspecified future date when I thought I had enough to make an impact. If you take nothing else away from this post, I hope it gave you a fresh perspective on the impact giving can have if you treat it as an investment. It’s easy to become discouraged or complacent when we think our small donations don’t really matter. But that isn’t true – just like starting an investment account with $20, if you keep contributing, and allocate your capital wisely, it will grow into millions by the time you retire. Is giving a part of your budget? Why or why not? Let me know in the comments! Thanks! Good to hear you have not had too much trouble keeping up the habit in retirement. I have never tithed 10%, but when do the finances for my church, I would say that may 5-10% of the people actually tithed. Most of my giving goes to help my children now when they need it. I don’t think that 10% is the goal we should strive for. Some may give more or less, or give in different ways. It’s the habit and mindset that’s important. I can see our children being a big portion of our spending when they get a little older! Thanks for sharing this! I agree with you on the fact that not enough people talk about this topic. You made my day! 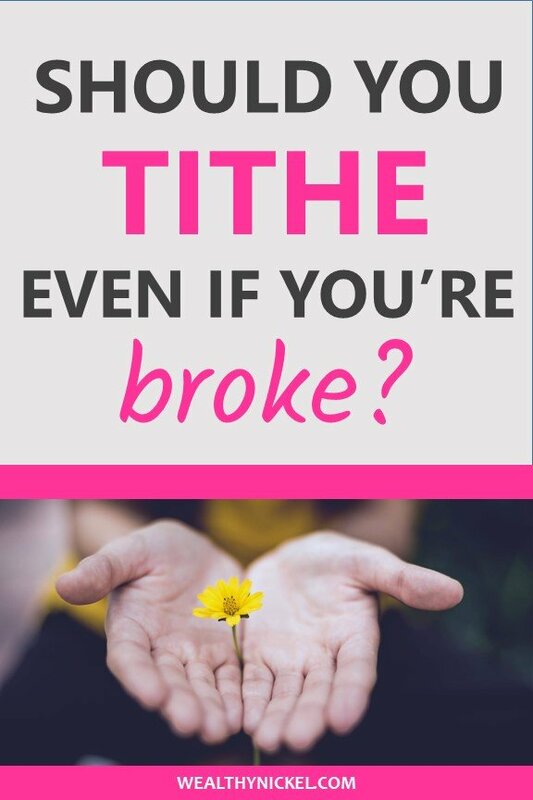 I have been paying a 10% tithe since I was little and it has always been a part of my finances. Thanks for reassuring me that it’s ok to include tithing as part of my personal finance adventure. You are awesome! Thanks for commenting – glad I was able to encourage you in your giving! Such a good conversation to be had. 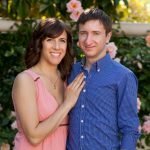 The FI community should be the best at giving, and yet, so often that is not the case. Thanks for commenting! I think this is a great area for the FI community to grow in. Thanks for sharing. It seems counter-intuitive to give while you’re in debt, but like you said you learn so much through the process! Excellent topic! Not much to say here but giving money to the needy is giving love, and this is the secret to lasting happiness. Thanks for commenting – 100% agree!